Putting human beings and other living things at the centre of your moral outlook. Seeing the world as a natural place and looking to science and reason to make sense of it. Promoting and supporting human flourishing across all frontiers, and championing human rights for everyone. Either they do not believe in the existence of a deity, or have no opinion, or find the topic devoid of meaning. They believe that excellent codes of behavior and morality can be created through reason. They believe that humans created the many thousands of Gods and Goddesses who have been worshipped now and in the past, in their own image. Practical matters: Secularism in the schools. Ethics without a God. Is it a religion? 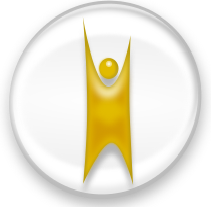 This is the International Humanist and Ethical Union's official symbol for Humanism. It has become the universal symbol referring to Humanists and Humanism (a.k.a. Secular Humanism).